It’s eight minutes past eight on the 8th of August, 1988. Wonder Woman is living it up in New York City, Batman is lying on a hammock in Hawaii, Thor is skiing in Japan, and Dr H8 is pointing 88 nuclear warheads directly at earth. When the best are busy, how many mediocre heroes does it take to save the world? According to the wacky 2D platformer from Bitmap Bureau, it takes no less than 88. 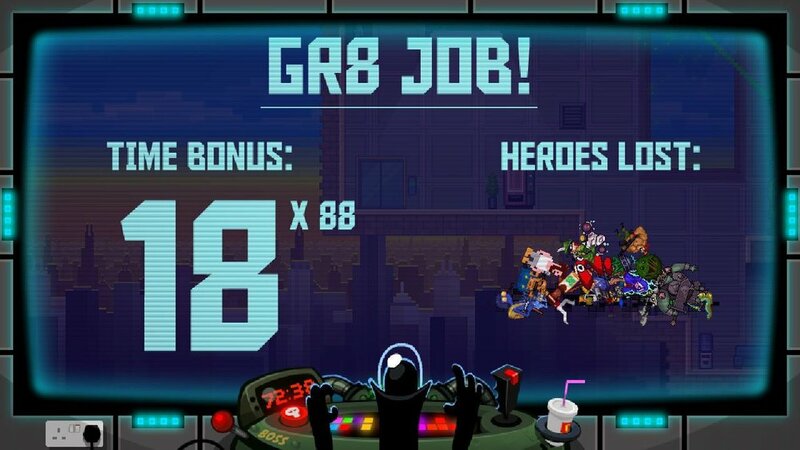 88 Heroes: 98 Heroes Edition is a wacky 2D platformer for the Switch that gives you exactly 88 minutes to jump, dodge and fight your way through the 88 levels of Dr H8’s headquarters, with — in this case — 98 heroes at your disposal. Your progression is viewed from the comfort of the eight-fingered Dr H8’s control room, where his minions march about the foreground, at times offering tea (“Sugar?”) and receiving a laser blast to the head (“I’m sweet enough!”). It’s these little humorous touches that give the game its irresistible charm. From the moment you press play, you’re treated to a steady steam of ridiculous puns that keeps things punchy and entertaining. The cheeky writing is complemented by a funky 90s-style synth soundtrack, which had me primed for some fast-paced 16-bit action! What keeps the game feeling less like an empty throwback and more like a fresh and creative reincarnation of an 80s arcade game are the 88 heroes themselves. While they sport varying degrees of ability — from those with no attack to those who can manipulate the game world itself — all have been lovingly crafted, with many inspired by popular culture. They each have a wonderfully distinct voice and catchphrase, and you’ll have a chance to read their punny names and giggle-worthy backstories at the spawn point of each level before leaping into the fray. The vast diversity of characters makes for a tumultuous first play. Their random rotation means you could start with Booster Goose, whose flying space fighter might quickly be smashed to smithereens by a swinging ball and chain. With him eight feet under, you might spawn Nibbles the Destroyer, a defenceless hamster who's as likely to fall prey to the jaws of a nearby croc as he is to drop straight into an unanticipated vat of acid. Every level is teeming with enemies and traps, which you’ll need some quick thinking and lightning-fast reflexes to avoid. The amount of times you die on first play is utterly hilarious… until it isn’t. Yes... only lost about half my team. Gr8. The vast variation in speed and ability among the heroes makes it almost impossible to get the hang of things, and most of them will be lucky to enjoy eight seconds of fame before meeting their untimely end. Some characters behave completely unexpectedly, such as Werebulk, who might mutate into his monster form halfway through a well-timed jump; then there’s Madam Missile, who’ll fly uncontrollably until she hits a wall, and the frustrating El Delayo, who really lives up to his name. With so much care poured into each hero, the developers seemed to run out of steam when it came to the levels and enemies, which start to feel a bit repetitive. Perhaps they felt restrained by the need to cater for every playable character, or thought a plain setting was necessary to keep the player from feeling overwhelmed by the chaos. Whatever the case, a touch more variation in these areas would have gone a long way in creating a more exciting experience. The same goes for the disappointing boss battles, which would have been the perfect opportunity to jazz things up, but instead feel rather stock-standard and underwhelming. While it’s tempting to speed-run your way through the game — especially with both your level timer and Doomsday clock ticking away in full view — you quickly learn that it pays to look before you leap, which can be done with the ZL and ZR buttons. But even when adopting a more cautious approach, a large chunk of my 88 were wiped out within just 30 minutes of play. I’d only progressed about an eighth of the way through the game, and the more I had to stop to read a new bio, the less fun they became. 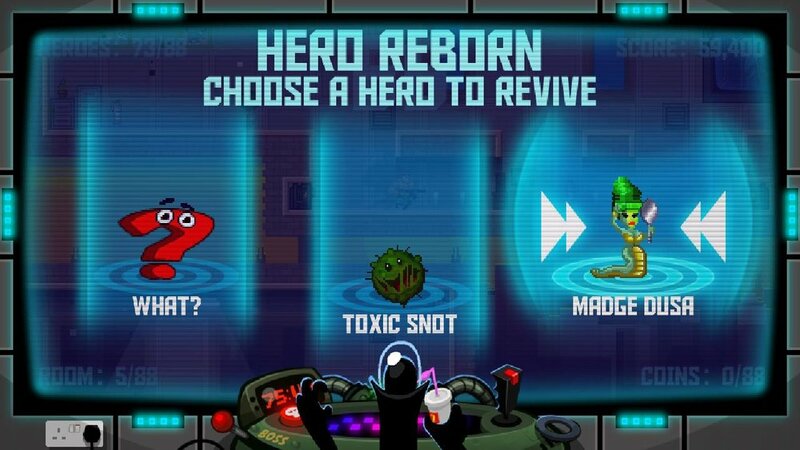 Heroes can be revived when you've collected 88 coins. Fortunately, the ‘Solo’ and ‘The Magnificent 8’ modes allow you to hand-pick your favourite hero or team of eight for some welcome familiarity. 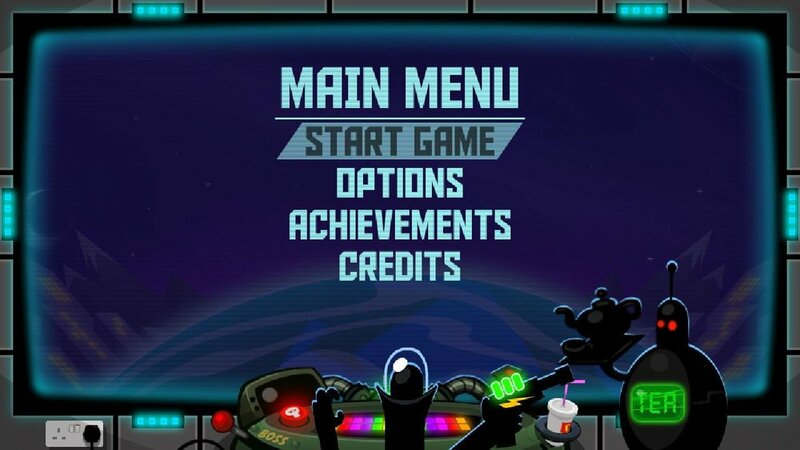 The Switch edition also includes ‘H8 Mode’, where the levels are much longer and fraught with far more death traps than the standard ‘88 Mode’. Despite H8 Mode’s difficulty, I enjoyed working my way through the intricate levels, getting better and faster with each attempt as I found my groove with the responsive controls. Like many classic arcade games, 88 Heroes’ punishing nature pays off when you finally complete a level you’ve been stuck on for ages. That immensely satisfying ‘hurrah’ moment was the hook that kept me playing. As a gamer who enjoys the handheld experience, it felt worth the sale price of $47. I’d also recommend it as a social game, with friends watching on as the colourful characters find victory and meet their demise at a dizzying rate. You come to 88 Heroes for the puns, crazy characters, fantastic voice acting and charming retro visuals, but you stay for the challenge. Few games offer 88 different ways to play, which is what sets this one apart from the rest. While I’m tempted to score this game an eight, the jarring gameplay, disappointing boss battles, monotonous levels and mundane enemies brought the entire experience down for me. I’m giving it 7/10.